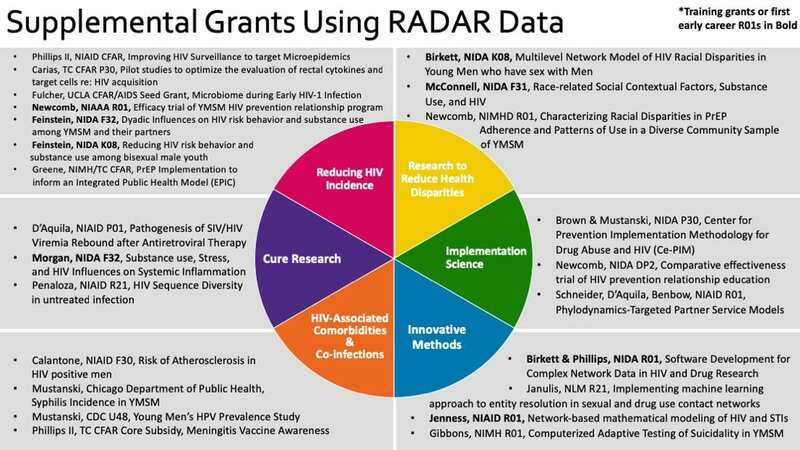 The RADAR Cohort was established as a platform for high-impact research to reduce high rates of HIV infection among YMSM through a wide range of innovative research efforts and future prevention programs. The work of RADAR is strengthened by over 25 broad collaborations with investigators from many disciplines and different methodologies. Many of those supplementary projects are listed in the graphic below, but new projects are often launching. February 27th, 2019. RSVP here. We welcome new collaborations, including those interested in using multi-site cohort data, advancing new projects or concepts, or utilizing data for new analyses. If you have a new project you wish to propose as a supplement to the RADAR project, please reach out to Antonia Clifford. If you are interested in secondary data analysis of previously collected data or specimens, contact Antonia Clifford to receive the Data Dictionary and the form for submitting a new concept. The Collaborating Consortium of Cohorts Producing NIDA Opportunities (C3PNO) is the coordinating center for the National Institute on Drug Abuse (NIDA) U01 cohorts. C3PNO manages and stimulates the use of the NIDA longitudinal cohorts and addresses high priority research on HIV/AIDS in the context of substance misuse. RADAR is a participating cohort and welcomes submissions utilizing data and specimens from multiple cohorts via the C3PNO online portal.